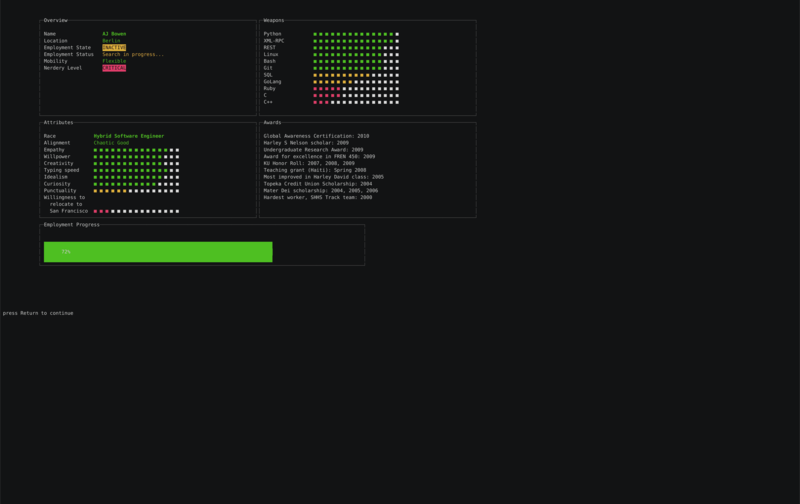 I thought it would be an appropriate use of time to make my resume viewable on the command line. Fork this repo and clone it to your machine. Log into your Docker Hub account and create a new Automated Build that will be triggered every time you push to your GitHub or BitBucket repo. This is fairly straightforward, and you shouldn’t need to change anything here. For more info, see Automated Builds on Docker Hub. In your Docker Cloud dashboard, select the Nodes tab, then click the “Launch a new node cluster” button. Create a 1-node cluster with a provider of your choice. Once the node has been created, you can get its URL from the Nodes tab. Create a CNAME with your domain provider to this address. In the “Stacks” tab, click the “Create Stack” button. In my case, I called my stack cv (as in resume) and defined a service named wopr (as in the name of the software it’s running on). Click the “Create Stack” button at the bottom. You’ll be taken to the stack overview page, where you’ll see a list of services associated with that stack (in our case, there’s only one). Click the service name. Currently the service has no containers. Before we deploy it, click the “Triggers” tab. Select the “Webhooks” tab, and click the + to add a new webhook. Pick a name, then paste the URL you copied after creating the trigger for your stack. You may need to manually trigger the first build, which you can do from the “Build Settings” tab in the Hub repo. Repeat the above steps to create an automated build-and-deploy for aiguillage. This is a fork of @jpetazzo’s repo of a super simple reverse proxy using nginx. As you can see, this stack serves as a reverse proxy for both my wopr server (cv.soulshake.net) and my blog (you’re looking at it). After you enter the Stackfile, click “Next: Environment variables.” Select your wopr service from the “Link services” dropdown, then click the Add button. Now go back to your Stacks tab, and click the green Start button next to each stack.